Fennel is thinly sliced, tossed with olive oil, and roasted in the oven. Barley is cooked, then spread out onto the baking dish with the fennel to absorb all the flavor. Then, the mixture is tossed with sliced radishes, quartered oil-cured olives (you only need a little, so I bought mine from the olive bar at the grocery story! ), and chopped dill. The vinaigrette is an easy combination of olive oil, orange juice, lime juice, shallot, and dill. Serve room temperature in a bowl or on a platter, topped with additional radishes, olives, and dill, and served with extra vinaigrette on the side. 1. Preheat oven to 425°. Chop fennel fronds and dill springs. 2. Rinse barley, then place in a medium pot and add enough water that the barley is covered by around an inch and a half. 3. Add pinch of salt to the pot and bring to boil, then reduce heat and simmer uncovered until water is absorbed, about 40–45 minutes. 4. While barley is cooking, slice fennel into 1/4 inch slices. 5. Toss fennel slices with 2 tablespoons olive oil in a medium bowl to coat. 6. Spread fennel slices out in a single layer onto a foil-lined rimmed baking sheet. Season with salt and pepper. 7. Roast until fennel is beginning to brown in spots, about 18 minutes (less if you have cut your fennel thinner). Let fennel cool on baking sheet. 8. When barley is done, spoon out onto baking sheet with cooled fennel slices. 9. Whisk together orange juice, lime juice, shallot (finely minced), 2 tablespoons dill, and zest. Gradually whisk in remaining 1/2 cup olive oil. 10. Slice radishes into thin rounds and cut olives into halves or quarters. 11. Transfer barley and fennel from foil to a large bowl. Add half of the radishes, olives, and 1/4 cup dill sprigs. Drizzle with 1/2 cup of vinaigrette and toss well. 12. 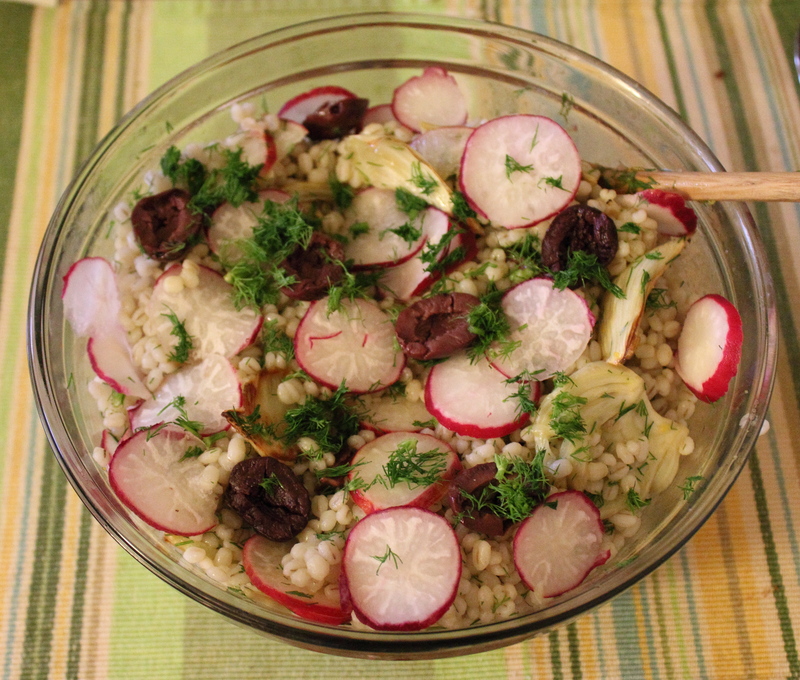 Top with remaining radishes, olives and remaining dill and fennel fronds. Serve with remaining vinaigrette on the side.